If you are interested in picking up one of Google’s new Pixel phones in the US, you can either go on the Google store directly or Project Fi or hit up Verizon for a unit. The latter is currently the only major carrier that offers the handsets and thankfully with no carrier lock and with updates coming straight from Google. 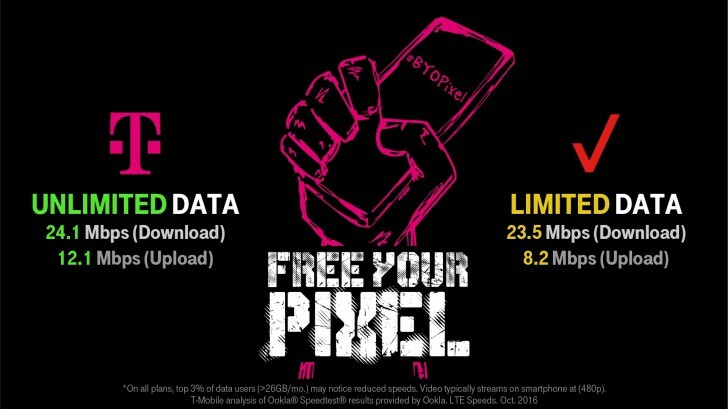 In the absence of a Pixel offer of its own, a few days ago T-Mobile launched a rather sneaky deal to draw more Pixel users to its unlimited data plans by offering them a total of $325 off monthly bills. Now in a rather anticipated response, Verizon has launched a purchase incentive of its won. It comes in the form of a rebate program. 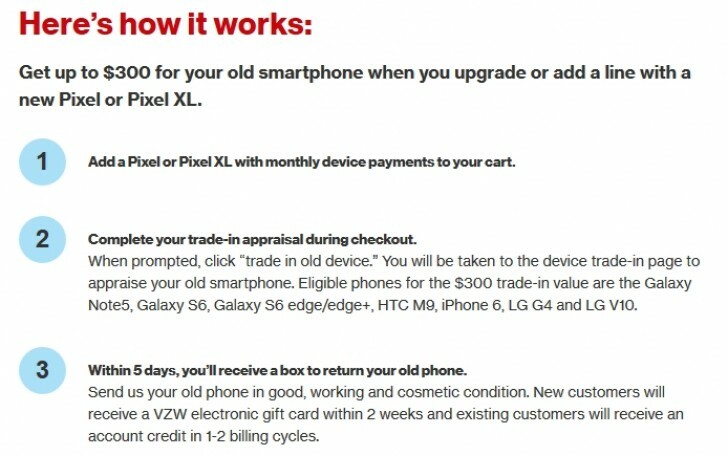 If you get the Pixel or Pixel XL on a monthly device plan and trade in your old device, you can get as much as $300 of trade-in value. Verizon will likely except any phone in working order and good cosmetic condition, but only a few models will qualify for the maximum amount of $300. These are as follows: Samsung Galaxy Note5, Samsung Galaxy S6, Samsung Galaxy S6 edge, Samsung Galaxy S6 edge+, HTC M9, iPhone 6, LG G4 and LG V10. We can only assume the carrier won’t frown on the 2016 follow-ups of said devices, but that probably wouldn’t be a sound trade given the $300 cap. Speaking of a sound trade, combining the two aforementioned offers might actually result in an essentially free Pixel phone. However, right off the bat, we will say that it is hardly something universally applicable or relevant to many actual users. Still, since Verizon is asking $649.99 cash for the 32GB Pixel or $27.08 over a period of two years, you could potentially take your phone in, provided it is on the list and slash the price to $300. Then, take you business over to T-Mobile and sign up for an additional $325 in savings. 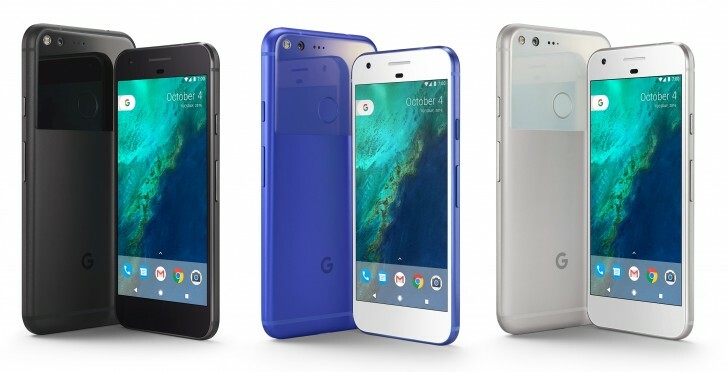 The latter won’t mind the Verizon origin of your Pixel and simple match would put its final price at $24.99. However, before you hit us up in the comment section, we will clarify that Verizon’s pay-back comes in the form of account credit or a VZW gift card, so you wound still have to find a way to spend the money at Verizon, instead of pocketing it and calling it actual savings. Plus, there is also the fact that T-Mobile’s offer caches in fully over a period of two years. That being said, the scheme is more of a peculiarity that, if nothing else, really helps to demonstrate the giant curve ball that Google threw at the mobile market by finally diving strong, head first with its very own branded smartphone line. The marketing wheels are definitely spinning overtime on this one.